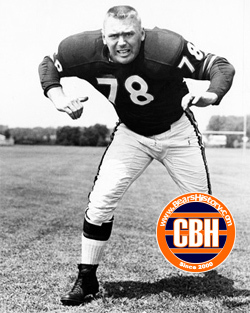 Versatile offensive and defensive lineman was drafted by the Bears in the fifth round of the 1953 draft. Was a "future" draft pick, playing for his alma mater Maryland that season before joining Bears in 1954. Made the Pro Bowl eight times. Played both offense and defense in 1962 but defense exclusively in 1963 when Bears won NFL championship. Traded to Redskins for his final season in 1966 as a favor by George Halas. Elected to the Pro Football Hall of Fame in 1991.